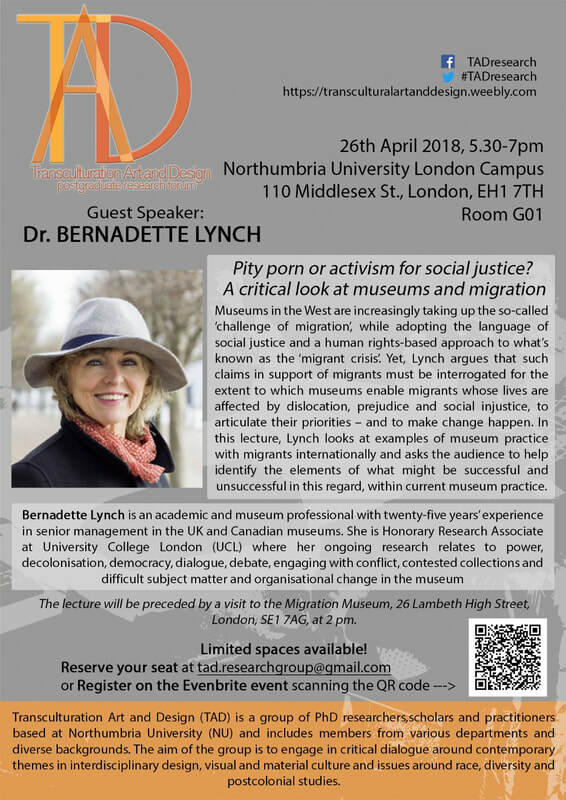 Hello, just thought I'd mention an external speaker event coming up on the 26th of April 2018 at the NU London campus (Middlesex St). Please see poster attached. This Tuesday 13th March between 10:30 and 12:30 a group of artists known as The Noematic Collective will be presenting their project GB8NOE. This project is a response to an exhibition of Susan Philipsz work recently exhibited at BALTIC. Join us in the Baltic 39 meeting room for discussions and a workshop by The Noematic Collective. ​Talkstudio is transforming itself into a vehicle for distributing conversations across studios in different parts of the country. 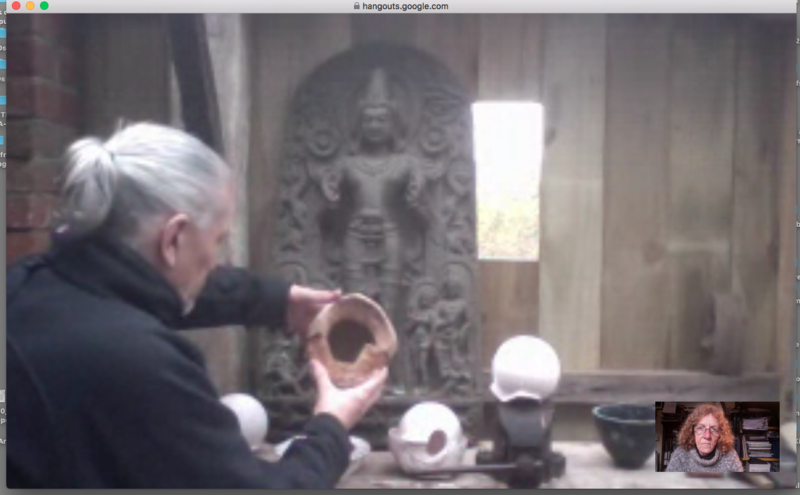 Last time I linked by Skype with Graduate Studio Northumbria, there was a relief sculpture behind me in my workshop. I bought it years ago in a junk shop but have never discovered what it represents, nor identified its precise place of origin in India. Of course the object is a cast. This is not carved and polished stone, it is a slab of polyester resin. Nevertheless, the cast presides over the small walled garden at the back of my house as if it is still a sculpture in a temple precinct. Stephen Bann calls this effect ‘ontological communion’ - the ‘there-ness’ at the end of the molding process is remarkably similar to that at the start. We have debated these kinds of low-level mediations in previous talkstudio sessions (for example, Ralph wondered if the digital duplication of a jpeg file on a computer was comparable). But since our last conversation I have been involved in a number of practice-PhD submissions in which the opposite is the case. Terms like ‘remediation’, ‘distributed authorship’, ‘distributed system’ and ‘proliferative preservation’ envisage in a maximum degree of change between the various terminals of an expanded reproductive process. If we stick to ‘ontological communion’ what comes out the mold occupies the same amount of space in my workshop as the object molded back in India. Furthermore, in the same way you would travel to India to stand before the original, you will have to visit me near Oxford to encounter what has been reproduced. In contrast, if you are intrigued by the arts researchers whose ideas will feature in talkstudio as their PhDs become publically available, then you can ‘remediate’ the entire experience by joining the next Skype session in a studio near you. Here you will encounter the distributed network of real-time locations from which our conversations are streamed live. ​This week we talked a bit about Simondon's press molding, and the history and uses of casts of sculptures (and a bit about Chomsky's deep systems of language). This reminded me of the Brian Massumi talks about force, and I've included a small pdf of a relevant section from Users Guide to Capitalism and Schizophrenia below. Our discussion on casts and press molds seemed for me to revolve around each cast ~through its material and proximity to the mold ~ being somehow close to or even equal to the sculpture from which the mold is taken. In that sense, the mold inscribes meaning onto the material, but as pointed out by Simondon there is this other thing, which could be equally IMO, called force or gesture. Chris, in ‘The pleasure of the holder: media art, museum collections and paper money’ points out that plaster has "little personality of its own" and its hard to disagree with that. Plaster seems something like a void, or a filler, with its only mildly active quality being its capacity to such in liquids, even from human skin. But, I think it still has some personality to it, some grit that stops it being a pure void. Just the same as the clay pushed into the press mold, no matter how perfectly mixed and how clever the pug mill, it will always be a little different from that last bag, that last handful. I've been taught at least 3 radically different ways of mixing plaster correctly, from three different casting experts, because there is a knack to it, and that knack is about reading the material, rather than a reliance on ratios. Hence the beautifully loose analogue of "single cream" (something all the methods have in common as a way of recognizing the end point). 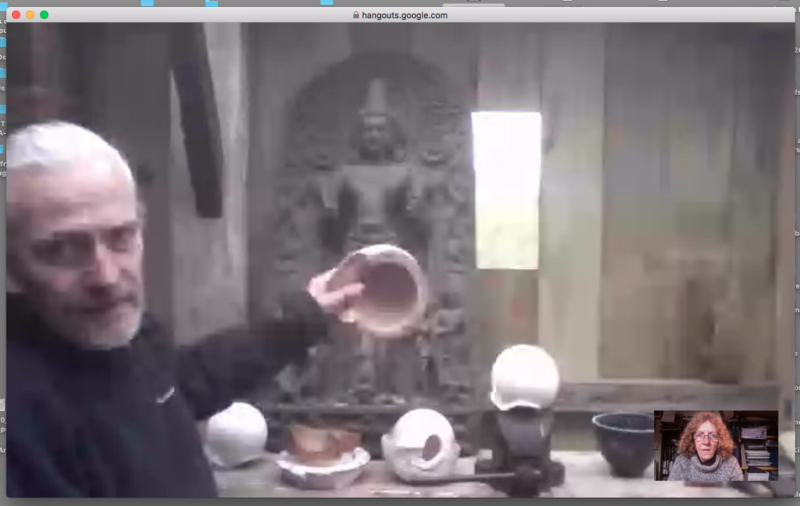 "The encounter is between two substance/form complexes, one of which overpowers the other. The forces of one are captured by the forces of the other and are subsumed by them, contained by them. The value of something is the hierarchy of forces which are expressed in it as a complex phenomenon. One side of the encounter has the value of a content, the other of an expression. But content and expression are distinguished only functionally, as the overpowered and overpowering. Content is not the sign, and it is not a referent or signified. It is what the sign envelops, a whole world of forces. Content is formed substance considered as a dominated force-field. Finally, right at the end of last week we were talk about the complex issue of working in a studio which is also part of an institution. The need to make something new, but also to meet criteria set by that institution. At the time I mentioned that this sounded like Deleuze and Guattari's conception of "Minor Literature", a literature which turns against itself. "A minor literature doesn't come from a minor language; it is rather that which a minority constructs within a major language. But the first characteristic of minor literature in any case is that in it language is affected with a high coefficient of deterritorialization" (Deleuze & Guattari, 1986). This seems to resonate strongly within an art institution's studio. To some degree, the we need to transgress existing structures, whilst still being beholden to some of them. I'm going to end with a quote from a piece of art critcism that's saved my practice on numerous occasions. "In retrospect, however, I am less intrigued by the play itself than by the joy attendant upon Erving’s making it, because it was well nigh universal. Everyone who cares about basketball knows this play, has seen it replayed a thousand times, and marveled at it. Everyone who writes about basketball has written about it. At the time, the crowd went completely berserk. Even Kareem, after the game, remarked that he would pay to see Doctor J make that play against someone else. Kareem’s remark clouds the issue, however, because the play was as much his as it was Erving’s, since it was Kareem’s perfect defense that made Erving’s instantaneous, pluperfect response to it both necessary and possible—thus the joy, because everyone behaved perfectly, eloquently, with mutual respect, and something magic happened—thus the joy, at the triumph of civil society in an act that was clearly the product of talent and will accommodating itself to liberating rules" (Hickey, 1997). Deleuze, G., & Guattari, F. (1986). Kafka: toward a minor literature. Minneapolis: University of Minnesota Press. Hickey, D. (1997). Air guitar: essays on art & democracy (1st ed). Los Angeles : New York: Art issues. Press ; Distributed by D.A.P. (Distributed Art Publishers). Massumi, B. (1992). A user’s guide to capitalism and schizophrenia: deviations from Deleuze and Guattari (A Swerve ed). Cambridge, Mass: MIT Press. Last week Pete posted a great text from Gilbert Simondon that uses the ‘press molding’ technique to picture how a form is always also a gesture. I thought I would respond to this idea with an image of a projection screen from Julian Rosefeldt’s nine-screen installation Asylum (courtesy of BALTIC Centre for Contemporary Art) in preparation for our next meeting on Wednesday 6th December at 11.00 am in Graduate Studio Northumbria (GSN). Do come along. Simondon’s idea brought to mind a discussion about casting in ‘The Raising of Lazarus’ (1996), an essay about the work of Anthony Gormley by the art historian Stephen Bann. His interest in the semiotics of visual culture leads him to puzzle over the ‘ontological communion’ that appears to unite forms that are molded with the cast reproductions made possible by molding techniques. I have written about Bann’s ideas in relation to Rosefeldt’s ‘Asylum’ (2004) in which immigrants are shown standing amidst plaster casts of Græco-Roman sculptures of the kind once seen in academies and museums across the Western world. The sense of dislocation represented in Rosefeldt’s image seems to sum up our loss of any ‘communion’ with a Classical past. None of us can stand amidst cast collections and be meaningfully connected any more. I like the way in which this argument is based on practice-based knowledge. Those who have done a lot of casting have a perspective on the discussion. Here is an extract from my article ‘The pleasure of the holder’ (2017). Sculptors do not expect the reproductive qualities of set plaster to bear any resemblance to those of the freshly mixed liquid handled by studio technicians. The sensuous weight of a bucket of plaster at the point it is ready to pour (just a little thicker than single cream) is very unlike the hardened matter that emerges when the mold is removed … At each stage this extraordinary casting material has little personality of its own, it simply takes on the characteristics of any surface it comes into contact with. Indeed, one could say that plaster displays an inherent inertness, a laziness that prevents it from maintaining its own qualities. This reproductive capacity has radical implications for our present-day dislike of inherited likeness, it involves prosthetic efficacy – in other words, it is not semiotic at all. Bann, S. (1996) ‘The Raising of Lazarus’, in Gormley, A. 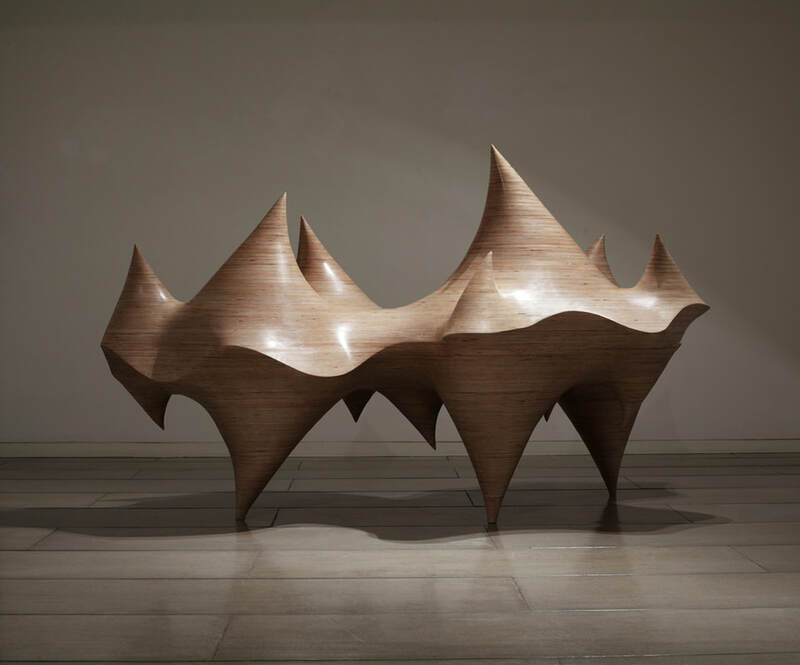 (1996) Still Moving: works 1975-1996, Tokyo: Japanese Association of Art Museums. Dorsett, C. (2017) ‘The pleasure of the holder: media art, museum collections and paper money’, International Journal of Arts and Technology. Greetings everybody. Chris has kindly given me access to the blog, so here's a picture to celebrate. It's Cha Jong Rye's Expose Exposed (2011). Unfortunately, we can't give people direct access to the blog without giving them admin privileges, and its unwise to spread those around too liberally. However, if anyone wants to put something up here, either because you think it is relevant/interesting, or you want to propose things we could read and/or discuss at the Talk Studio, email me at pete.wolfendale@gmail.com. Alternatively, feel free to discuss this stuff in the comments. "Matter is matter because it receives a positive property which enables it to be modeled. To be modeled does not mean to undergo arbitrary displacements, but to order its plasticity according to definite forces that stabilize the deformation. The technical operation is the mediation between an inter-elementary unit and an infra-elementary unit. The pure form already contains gestures, and the primary matter has the capacity to become; the gestures contained in the form meet the becoming of the matter and modulate it. So that the matter can be modulated in its becoming, it is necessary that it is, like the clay at the time when the workman presses in the mold, of a deformable reality, i.e. of the reality which does not have a definite form, but all the indefinite forms, dynamically, because this reality, at the same time that it possesses inertia and consistency, is the agent of force, at least for a moment, and is identified point by point with this force; so that the clay fills the mold, it is not enough that it is plastic: it is necessary that it transmits the pressure that the workman presses on it, and that each point of its mass is a center of forces; clay is pushed in the mold which it fills; it propagates with it in its mass the energy of the workman. During the time of the filling, a potential energy actualizes itself." Have you seen the new Instagram account? ​1) Steinberg, L. (1972) 'The Flatbed Picture Plane', in Other Criteria: confrontations with twentieth century art, by Leo Steinberg, New York: Oxford University Press, 1972, pp 55-91. 2) 'Life as Such', Jane Yager's review of The Weight of Things by Marianne Fritz, trans. Adrian Nathan West, New York: Verso Books, 2017, in The Times Literary Supplement, November 3, 2017, p 24. 3) Dorsett, C. (2017) 'Studio Ruins: describing unfinishedness', in Frances Robinson & Elodie Roy (eds), Studies in Material Thinking 17. Have you noticed the article by Homi Bhabha posted on the talkstudio basecamp? Reading it alongside the other pieces of writing that have crossed my path this week, I was struck by Bhabha’s use of the term ‘address’. We ‘address’ an art school as a place of cultural production. Bhabha talks about a space of writing and a place of hybridity, so we can safely debate the address at which we work and study as a place of practice. But in doing so we also ‘place’ ourselves in relation to other addresses, other fields of knowledge in which we are not just translated and re-articulated but also transferred and dis-placed. The following photographs glance at moments of recent reading in which I thought about Bhabha’s idea. 1) ‘Storm sky bright’, Pamela Clemit’s review of Coastal Works: cultures of the Atlantic edge, Nicholas Allen, Nick Groom and Jos Smith, (eds), Oxford: Oxford University Press, in The Times Literary Supplement, October 6, 2017, p 27. 2) Clayton Childress, (2017) Under the Cover: the creation, production, and reception of a novel, Princeton and Oxford: Princeton University Press, pp 8-9. ​3) Trevor Pateman, (2016) Materials and Medium: an aesthetics, Brighton: Degree Zero. Tomorrow at 10.00 am (Wednesday, 8th November, 2017), Glass Box, Baltic 39, High Bridge, Newcastle-upon-Tyne, NE1 1EW. Our last meeting, involving a relatively small group, talked about Andrew Gallix’s TLS review of The Disappearance of Literature: Blanchot, Agamben, and the writers of the No by Aaron Hillyer (Bloomsbury Academic, 2013). Talkstudio has discussed Hillyer’s book before but this time some new departures were made possible by the introduction of concepts such as Hegel’s ‘absolute negativity’. At one point I speculated that Hillyer’s approach to creative refusal was already built into Contemporary Art through the ‘not-landscape / not-architecture’ option that sets up Rosalind Krauss’ famous expanding diagram in her essay Sculpture in the Expanded Field. ​I’m not sure there was much consensus; however, as we reflected on the discussion it became clear that reading book reviews opened up unexpected vistas across unfamiliar fields of knowledge. Perhaps literary reviewers help us to locate a terrain of ideas around our work precisely because they are not talking about the visual arts. Should talkstudio debate this further? Would this be the same as theorising ‘practice’? Here is the opening paragraph of a recent TLS review that offers a perfect example of a vista that has been opening up to artists for some time. ​Both of these books emerge from the burgeoning academic category of “literary-mobility studies”, or what used to be loosely termed travel writing: a terrain some twenty years in the making, and by now criss-crossed by multi-disciplinary exploration not only of travel and its wealth of associated literatures over the centuries but also by sociological tracks such as migration, social and gender studies, modes of transport, and the impact of wars and power hierarchies. En route, the methodologies of the field of study itself are being turned over and re-evaluated, often revealing that “cultures” are not the set-in-stone concepts we may have inherited, but porous and volatile. Add to that the gems of vocabulary being unearthed, such as “prosopographical” or “loco-descriptive”, and the fact that “textual mobility” (as in “unfettered syntax”) is part of the territory, and it’s clear that mobility studies themselves are on the move. Annette Kobak, ‘Excess Baggage’, The Times Literary Supplement, September 26, 2017, pp 3-4. ​Looking outwards from an art school environment, what does this talk of ‘mobility’ mean to us? Those of you who attended Christine Borland’s recent Doubtful Occasion at Glasgow Museums Resource Centre may agree that ‘mobility studies’ was sharply in focus that day simply because our particular encounter with the stillness of objects seemed to have been excluded, perhaps even negated, by this emergent field of study. Come along to our next session for more debate: 10.00 am to 12.00 midday, Wednesday, 25th October, 2017. Note that there is a change of venue. We are meeting in the Glass Box, 1st Floor, Baltic 39, High Bridge, Newcastle-upon-Tyne, NE1 1EW. ​Rather, my own experiences of Talkstudio suggest that our thinking is really embedded in something quite unlike the smug photographs in Imagination's chamber: artists and their studios by Alice Bellony-Rewald and Michael Peppiatt. ​In a recent article for the academic journal Studies in Material Thinking I debated how this kind of scholarly writing about art occludes the actual states of mind encountered in studio work [https://www.materialthinking.org/people/chris-dorsett]. I built my discussion on photographs of studio mess made during ‘health and safety’ inspections at our University. So come along on Wednesday to find out more about the dilemmas of writing about the actual outer limits of creative practice. Hopefully this will get the new year of Talkstudio under way.